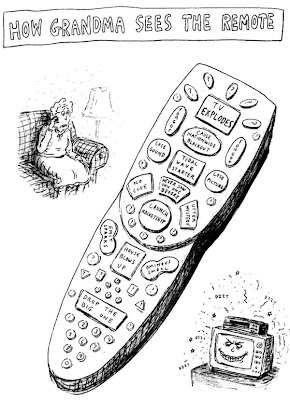 A great little cartoon from Roz Chast, on bookofjoe - and how true it is! I especially appreciate the fact that this remote is clearly modeled on the Comcast frankenremote that so many of us know and hate. The problem? Too many to mention: redundant keys, no sensible grouping, horrible ergonomics, no flow for common uses, and on and on and on. Don't worry, Grandma, we feel your pain.